"Creativity is the making of the new and the rearranging of the old in a new way." He believes creativity is not entirely intuitive or mystical, that it is a rational process that can be learned and taught. This best-selling series explores a proven and unique approach to the process of producing creative thought and effective solutions to problems. The Creative Thinking System is reshaping the working habits of people using it throughout the world. 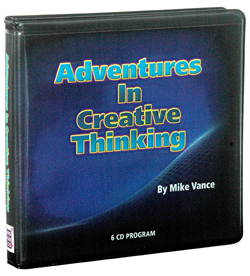 This live-recorded, six-CD program includes effective ideas on removing obstacles that block the creative process while assisting people to break out of ruts into innovative thought patterns. NOW, you too can tap the creative principles that operate within the universe. NEW! An MP3 file of this audio program is also available for digital downloading for use on digital readers and devices.